There are no wedgies in baseball! Despite how much this looks like a bunch of guys reliving their favorite schoolyard prank, it's really just an innocent picture of one guy helping another. The scene: Wednesday night's ballgame between the Nationals and Cardinals at Nats Park. 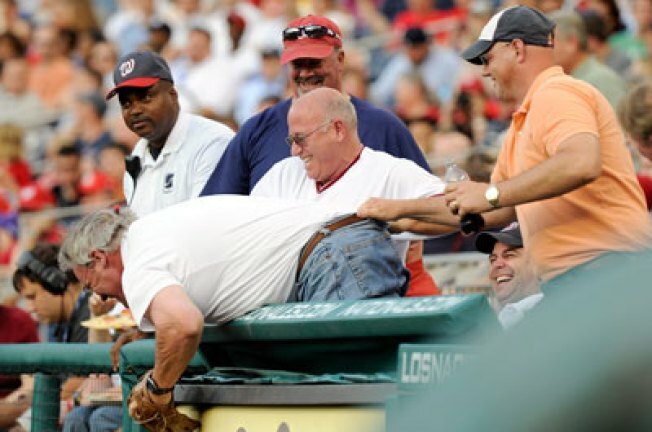 The incident: One fan reached for a foul ball down the line ... and couldn't get back up. So it was up to the friendly fans in his row to give him some, shall we say support? We shall.